No longer will legislative trackers be limited to the 6 stages in becoming a law described on Congress.gov, or even the 13 steps described by this handy infographic by Mike Wirth and Suzanne Cooper-Guasco (“How Our Laws Are Made”, First place award in the Design for America contest, 2010). Now we’ll be able to see the various pieces of bills that make it into other bills. This is an amazing new looking glass into the legislative process. Thanks GovTrack.us! This new analysis literally doubles our insight. Only about 3% of bills will be enacted through the signature of the President or a veto override. Another 1% are identical to those bills, so-called “companion bills,” which are easily identified (see CRS, below). Our new analysis reveals almost another 3% of bills which had substantial parts incorporated into an enacted bill in 2015–2016. To miss that last 3% is to be practically 100% wrong about how many bills are being enacted by Congress. And there may be even more than that, which we’ll find out as we tweak our methodology in the future. Who are the sources of these enacted provisions? How often is this cut-and-paste process cross-partisan? What provisions were removed from a bill to be enacted? Is cut-and-paste more frequent today than in the past? 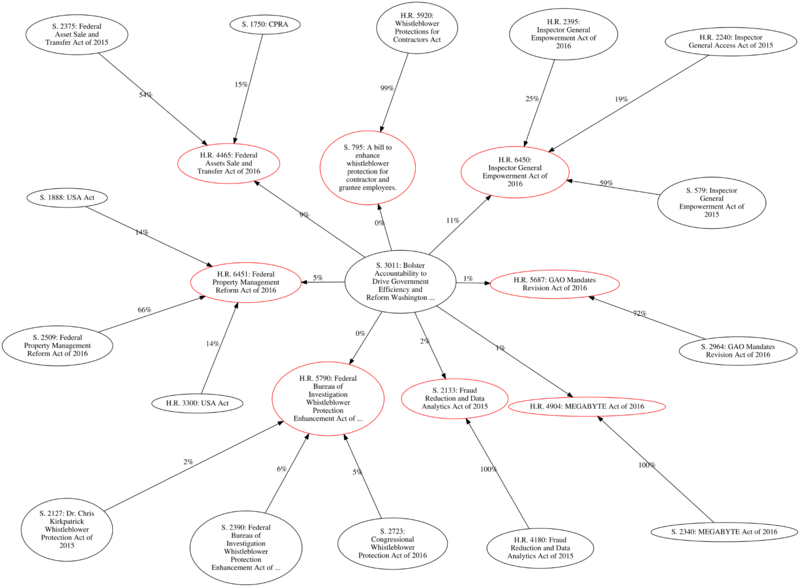 via How a complex network of bills becomes a law: Introducing a new data analysis of text incorporation… – Medium. ProPublica launches tool to track Congressional members, encourages data download! Check it out, bookmark it, and let your library patrons know about it! Today ProPublica is launching a new interactive database that will help you keep track of the officials who represent you in Congress. The project is the continuation of two projects I worked on at The New York Times — the first is the Inside Congress database, which we are taking over at ProPublica starting today. But we also have big plans for it. While the original interactive database at The Times focused on bills and votes, our new project adds pages for each elected official, where you can find their latest votes, legislation they support and statistics about their voting. As we move forward we want to add much more data to help you understand how your elected officials represent you, the incentives that drive them and the issues they care about. In that way, it is also a continuation of another project I worked on at the Times. In late 2008, The New York Times launched an app called Represent that connected city residents with the officials who represented them at the local, state and federal levels. It was an experiment in trying to make it easier to keep track of what elected officials were doing. Because ProPublica is rekindling that effort, we’re calling the new project Represent. The new Represent will help you track members, votes and bills in the House of Representatives and Senate. We’re also launching a Congress API, or Application Programming Interface, so developers can get data about what Congress is doing, too. via A New Way to Keep an Eye on Who Represents You in Congress – ProPublica. A Sunlight Foundation analysis found only 15 percent of congressional websites are ready for HTTPS. Sunlight analysis reveals only 15 percent of congressional websites are HTTPS ready by Tim Ball, Sunlight Foundation (May 26, 2015). In this article we will describe the methodology of the survey and present the survey results. We will also offer a brief analysis of what can be done to address the situation. It is important to note that this evaluation should not and is not a reflection on individual members of Congress or their websites, but is reflective of the entities that host those websites. We know this because across the 652 websites surveyed they were only served from 24 IP addresses. Sunlight is interested in seeing Congress take sound steps to properly secure its — and the American people’s — information. This author, in particular, hopes that lawmakers will read this analysis and ponder some of the questions that have been raised, potentially making changes to improve their security practices. To that end, we’ll run these tests again periodically to identify any changes that they may or may not make. See you all very soon! Andrew Weber, Legislative Information Systems Manager at the Law Library of Congress, writes about the history of THOMAS, which is now Congress.gov. Twenty Years of THOMAS, by Andrew Weber, In Custodia Legis, blog of the Law Library of Congress (January 5, 2015).